Welcome to AMS Estate Liquidation! When you're looking for a reputable estate liquidation company...Look into AMS! We are the ONLY City of Denver company that is BBB accredited with an A+ rating. We recommend that you review our rating online. 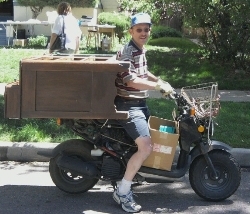 AMS is employee-owned and is one of the oldest and most trusted estate sale companies in Denver. We have served the metro area since 1986. Our crew represents 75+ years experience in estate liquidation in metropolitan Denver. Integrity is one of our core values! Call us for a free quote - 303-929-4530. Stay tuned for details about our next sale! We continue to look for estates that meet our quality standards. As you know, AMS does not focus on the quantity of sales we provide throughout the year. More than three decades later, we continue to be selective in our process. We believe that is the only way to truly deliver outstanding estate sales with quality items. We don't have a warehouse. We don't offer "sweetheart deals" to the select few. We don't have an online business or auction. We purposely made those decisions and consider them to be positive attributes so we can focus entirely on delivering a top notch sale on-site - at your estate. AMS has earned its A+ rating from the Better Business Bureau for a reason -- our longstanding work ethic and integrity. Yes indeed, we truly do mean it when we say "move it yourself." Our experience assures you that we recognize the value in your belongings. Our tried and true methods and excellent reputation translate into bringing the highest prices for your possessions. We have a professional appraiser on staff and do not hesitate to seek the assistance of specialists in any field in which we are not expert. We collect and pay state and local sales taxes. We bring all materials needed to run a successful sale. We take care of the Advertising (we place an ad in the local newspapers, put up strategically posted signs in the neighborhood, promote the sale to our extensive email list and record detailed information about the sale on a phone line called the AMS Hot Line), and of course, details and photos are included on this web site). Established relationships with proven buyers but have no arrangements giving dealers priority. We do not have a shop or warehouse so have no conflict of interest. Everything is sold that weekend. Free initial evaluation/consultation. Give us a call today! Will you earn a greater return if you sell “big ticket” estate items on your own? Why hiring an estate liquidator with the lowest percentage could cost you a bundle! It’s more important than ever to find the RIGHT estate liquidation company. We’ve come up with the 5 Questions you should ask when you are researching estate liquidators. We hope you find them helpful! Copyright 2002-2016. AMS Estate Liquidation. All Rights Reserved.